This is the outside of my house. 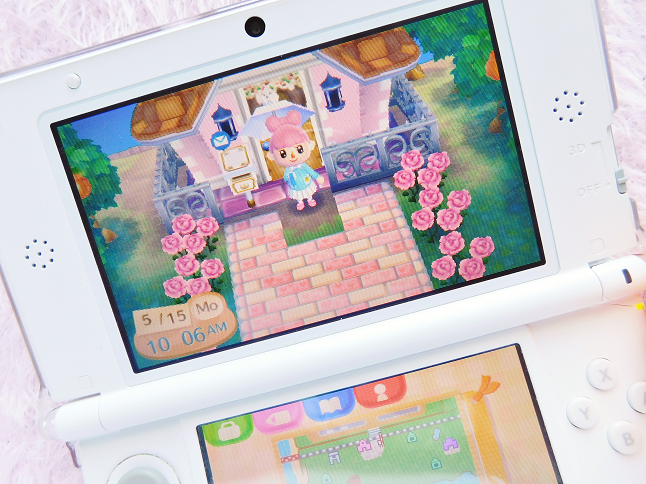 I have paid off my house so I have all of the rooms installed to the biggest size. 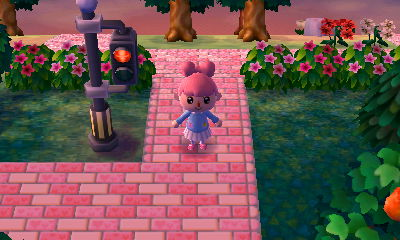 As for the outside of my house, I have this pink sidewalk placed throughout my town. On the sides, I have dozens of pink roses planted. 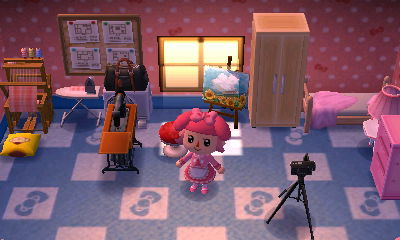 Before I talk about more about my town let's look at a couple of my rooms in my home. 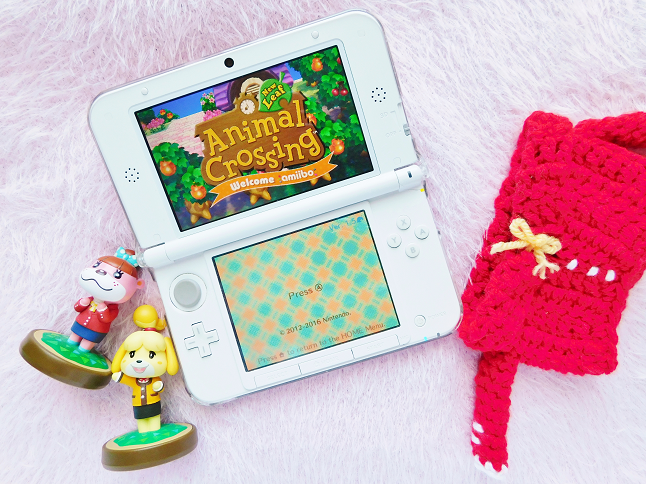 Here is a list of the villagers currently in my town. 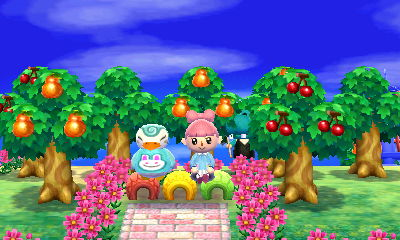 Since the town is called Foodie I want all of my villagers to either have a food related name or look like food. 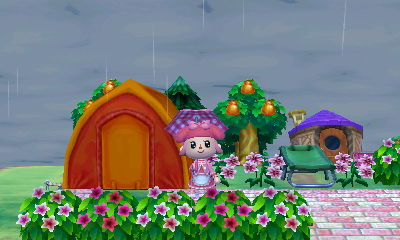 I really want Zucker to move in! This is the entrance room. On the left, I have a kitchen and on the right side, I have a living room complete with a Wii Fit Board and Wii U (which I standing in front of, lol). The wallpaper and flooring are from Lottie. 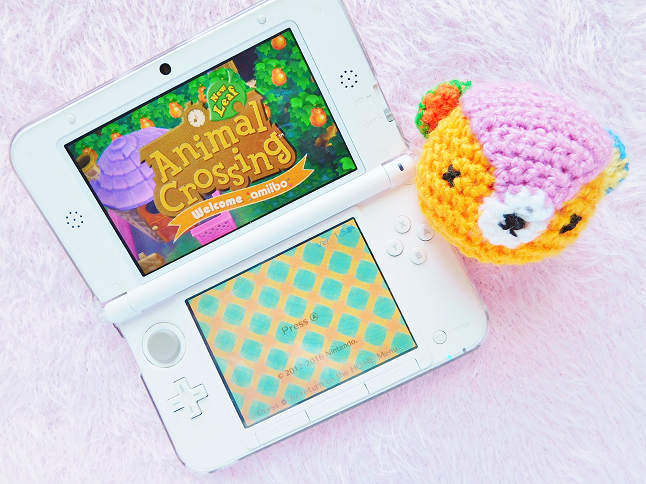 If you scan her Amiibo figure you can get them too! 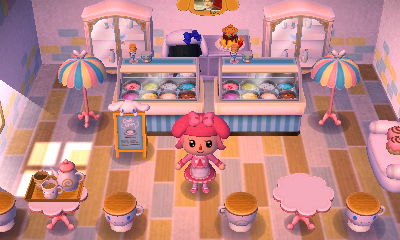 If you enter the left room you reach the ice cream parlor! 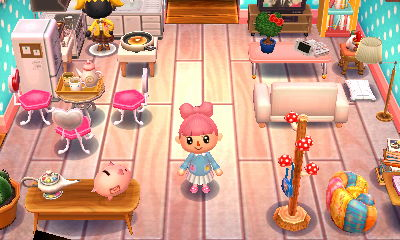 Most of the furniture is from the Sanrio Cinnamoroll Amiibo card. This is probably my favorite room in my house! If you go to the room in the back you reach my room. On the top left side I have a bed, closet, and side table, On the lower side, I have a craft area. On the right side, I have desk area and restroom. 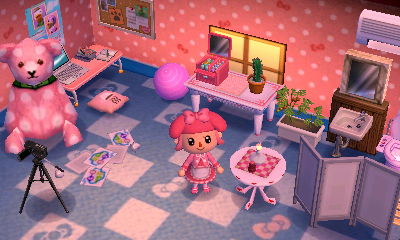 The wallpaper and floor are also from a Sanrio Amiibo card (the Hello Kitty one). 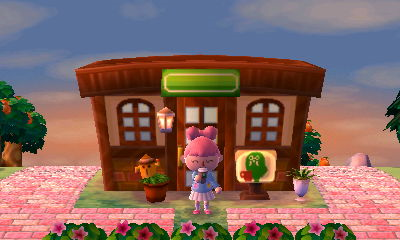 Does anybody else go to The Roost Cafe after they've finished their daily chores? Chilling with Sprinkle on colorful tires. Outside the camp site on a raining day. The stop light is one of my favorite public work projects! How do you put flooring outside?